I knocked out a quick feature connecting LibraryThing works pages to their corresponding page on Metacritic. Metacritic is like RottenTomatoes, giving brief excerpts from press reviews and boiling them down into a single number (the “Metascore”). Unlike RottenTamatoes, Metacritic covers more than movies. Here’s an example from Sam Harris’ The End of Faith. Metacritic’s books coverage does not seem as strong as some other categories (560 ISBNs total), but I think it’s useful and interesting. Perhaps some day LibraryThing will collect review snippets itself, but for now Metacritic should be a useful link. Metacritic was informed of what we were planning, but no money changed hands. Hey, who can turn down a free link? I’m flying back from four talks in four days—Computers in Libraries (twice), the Library of Congress, and Digital Odyssey in Toronto. Derik A. Badman’s cartoon of Roy Tennant (left) and me (right) giving talks. Actually, Roy’s example was about murdered midget gypsy prostitutes. Well that’s three conferences he won’t be invited to! At CIL I got a lot of opportunity to show off LibraryThing for Libraries, our new push to put LibraryThing data into library catalogs. Response was positive, even fevered. *** Demos went well, showing book recommendations and tags in a large public library. (“Chick lit” and “cyberpunk” are great examples, but I have to size people up quickly to know which one to use.) There was a certain amount of disbelief about its coolest feature–no back-end integration and working with any system. But anti-system-vendor sentiment is so high that this was welcomed. The first round of libraries should be at least a dozen strong, with both academics and small and large publics. The highlight of all three conferences was the chance to puts faces to names, often names of blogs. My Google Reader feed is suddenly full of people I know! (But if I start listing I’ll surely forget someone…) I had a couple good meals, one good argument, a great lunch conversation at the LC and, as a coda, a stroll around Toronto. *Among other things they need to synch it up with the “slides.” But I do my talks live, driving around at breakneck speed. The staffer assigned to coordinate the synch looked positively frightened. **I owe a blog post revising my post about OCLC and MIT. Apparently OCLC didn’t stop them, but MIT legal. ***I came back from one talk to find the booth table littered with business cards. I felt like an NBA star at a nightclub. From now on if a public library or a college or university wants to buy memberships for everyone in a community, it’s 5¢/patron, $1/student. Our newest book pile contest theme is cooking. * For something new, we’re teaming with Abebooks. They’re co-sponsoring the contest, and offering a fantastic grand prize—$100 to use on AbeBooks.com. See their announcement of the contest here. 1. Take a photo of your books. Be creative and inspired! Remember, the theme is cooking. 2. Post the photo to Flickr. You’ll need a Flickr account to do this (it’s easy and free). Special note on Flickr—photos from new accounts don’t always show up on the global tag page right away. If your photo isn’t showing up here, you can always post the URL in the comments to this blog post, we’ll make sure to find it. Need inspiration? 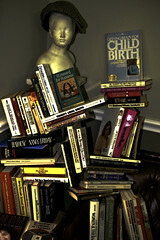 Check out the book pile archive for past winners, or Abebooks’ new “Books for Cooks” section. *Maybe it’s that my recent move unearthed all the fancy but long-forgotten kitchen tools, or maybe it’s that I just read Julie and Julia,** but I’m in the mood to cook lately. No really! One of my favorite bookstores* reminded me that today is “Drop Everything and Read Day”. Sponsored by Ramona Quimby, of course, and celebrated on Beverly Cleary’s birthday. So go to it! Over on Thingology I give a sneak peek of the upcoming LibraryThing for Libraries feature—putting LibraryThing in library catalogs. Finally! Sorry for the delay in posting the winners to March’s bookpile contests*. 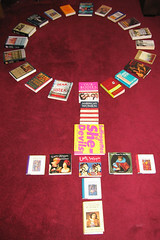 The challenge was a pile to do with spring, Women’s History Month, or Small Press Month. And trust me, I needed the extra time, it was hard to pick from all the incredible pictures! 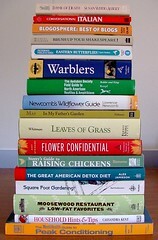 Goodsoul (Flickr user PhotoSensate) wins for this mother-inspired book pile. It’s fantastic. I say no more, you must go read the description yourselves. Runner up one. How could you not love Pesky Library’s contribution: Spring Chicks dig Chick Lit! 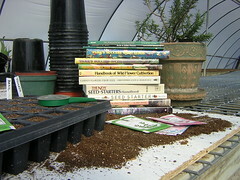 For runner up number two, by vonlafin I loved this spring greenhouse photo—and nothing says spring like dirt! I’ve added a third runner-up, just for this last photo, about all the projects planned for spring, from dieting to gardening to learning Italian to reading in a hammock. I love it. There were just too many good entries to display just the winners, so here are a few more favorites. HerStory was very creative, and full of history! 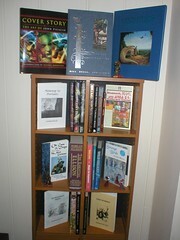 And lastly, a shout-out to our only submission featuring small press books, by leennnadine. See most of the entries here, and the rest are linked to in the comments to this blog post. *I was dealing with my own personal book-piling (rather, piling boxes of books), since I spent the last week moving into a new apartment. **All winners, please email me so I can pass along the prizes! (abby@librarything.com). Actually, if I’ve posted a picture of your bookpile, email me with your LT user name, so I can include it in the blog post! Today’s farewell announcement by Library Stuff blogger Steve Cohen is sad news to many. But not to us at LibraryThing. Finally, the name we always wanted has come free! After a quick round of emails I can announce that Steve has agreed to a complete buyout. LibraryThing has been renamed LibraryStuff. With the move to LibraryStuff, LibraryThing increases its VMF or “Vague and Miscellaneous Factor,” important in appealing to its target audience—jaded catalogers and information architects sick to death of the cut-and-dried certainties and voodoo-ontology of the Dewey Decimal System and of Library of Congress Subject Headings. LibraryThing held out hope some sort of definite or even “real” Thing, a “false move” which left the Lib2.0 cognoscenti shaking their heads about how the Man was telling them what to think. LibraryStuff promises no such certainties, just stuff. Don’t want the stuff? Fine, we’ll keep it. The historic buyout brings Steve Cohen on board as legal librarian, book reviewer and resident namer. The terms of Steve’s buyout were not disclosed, but let’s just say Ari and Hallie are set. First on Steve’s renaming list is our upcoming “Library Services” feature. We were planning to keep the generic “LibraryThing Library Services” name, but adding the tag line Make your OPAC Sing… with LibraryThing! but now that Steve is on board we can expect a major rethink—”Stuff for Libraries from LibraryThing,” etc. We also understand the name “Horizon” has also come free. The decision to join up with LibraryThing finally puts to rest Steve’s lingering “payola” scandal. Back in August 2005, Steve unwisely accepted a free membership to the one-day-old LibraryThing. Since then, he has been forced to issue disclaimers every time he mentions the site. The scandal boiled over when it was revealed that LibraryThing allowed Steve to enter a family video into our Hanukkah Book Pile contest although the video included no books at all! Subsequent revelations that Steve has also acquired free accounts to Shelfari, Gurulib, Anobii and Amazon have only fueled the outrage. At this point, all he could do was cash in. Update: Major developments also coming in from OCLC, Google, TechCrunch. Yes, the new logo is in Cooper Black.